Freediver Forrest Simon owes a lot to his greatest passion, both competitively and recreationally. In this video, he dives much deeper into the analysis of freediving and its health benefits on the conscious mind – its ability to open a new door of fresh perspective, removing you totally from the stresses above water. Sounds a lot like a guided meditation. The more we learn about health and wellness, the more value one places on mindfulness and slowing down our over-stressed and anxious brains. It seems that for Forrest, freediving may be the key to fully living in the present moment and harnessing inner peace. 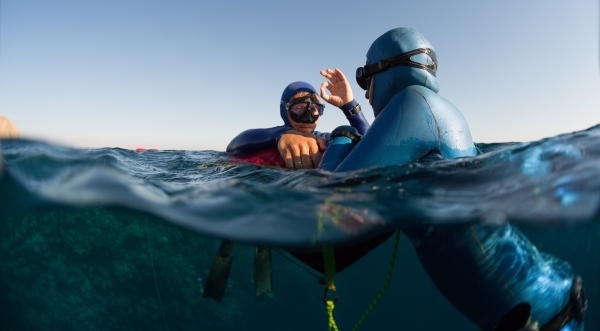 Forrest chose a career as a PADI Freediver Instructor Trainer so that he could spread his love for the sport with others and help grow the freedive community. For Simon, it’s not just about teaching people to hold their breath and dive to a certain depth; it’s about sharing the enlightenment he discovered through freediving, and passing that power of transformation on to someone on a similar life journey. Forrest Simon pursued his greatest passion, freediving, both competitively and recreationally. He chose a career as a PADI Freediver Instructor Trainer so that he can spread his love for the sport with others and help grow the freedive community. Freediving has been integral in defining who he is today. For Forrest, it’s not just about teaching people to hold their breath and dive to a certain depth; it’s about sharing the enlightenment he discovered through freediving, and passing that power of transformation on to someone on a similar life journey.